Browse: Home / CimSweep v0.5.1 is a suite of CIM/WMI-based tools to perform incident response & hunting operations all versions of windows. 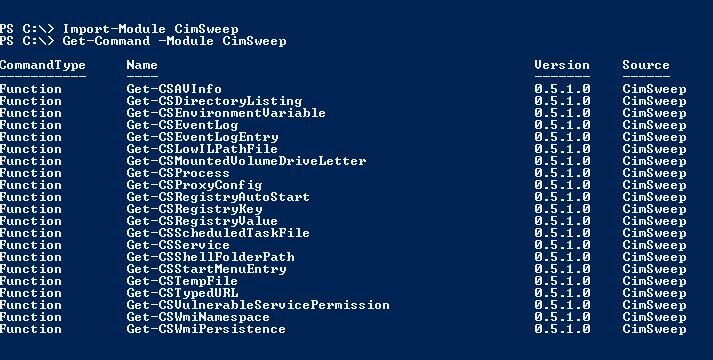 CimSweep v0.5.1 is a suite of CIM/WMI-based tools to perform incident response & hunting operations all versions of windows. + Added module-wide Pester tests to ensure consistency across functions. + Removed the -Path parameter from Get-CSRegistryKey and Get-CSRegistryValue. -Hive should be used. CimSweep is a suite of CIM/WMI-based tools that enable the ability to perform incident response and hunting operations remotely across all versions of Windows. CimSweep may also be used to engage in offensive reconnaisance without the need to drop any payload to disk. Windows Management Instrumentation has been installed and its respective service running by default since Windows XP and Windows 2000 and is fully supported in the latest versions of Windows including Windows 10, Nano Server, and Server 2016. Agent-based defensive tools are extremely powerful but they also require deployment of the agent to each system. While agent-based solutions absolutely have a place in our industry, they tend to be very expensive and can be easily detected/thwarted by determined attackers. CimSweep enables the acquisition of time-sensitive data at scale all without needing to deploy an agent. 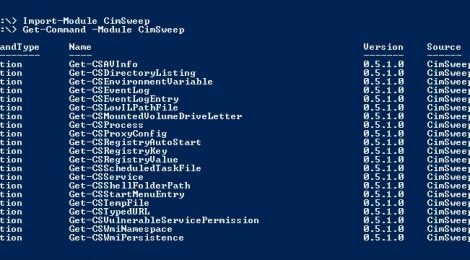 It is called CimSweep based upon the fact that it utilizes the extremely powerful CIM cmdlets in PowerShell. CIM cmdlets support the WSMan protocol by default but it may also fall back to using DCOM on systems that either cannot support or do not have the Windows Remote Management (WinRM) service enabled. 1. PowerShell version 3 or above is required. The CIM cmdlets were introduced in PSv3. 2. Elevated credentials to the target hosts. By default, all remote WMI/CIM operations require credentials for users belonging to the Administrator’s group. 1. Any Windows OS dating back to Windows XP or Windows 2000. 2. The WMI service (winmgmt) must be running. It is running by default. 3. Host and network firewalls must allow remote WMI/CIM management ports through. 4. For systems where the WSMan protocol is desired, the WinRM service must be running. 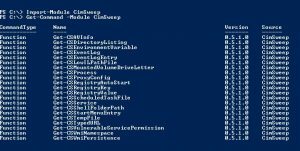 If PowerShell remoting is already enabled, the WinRM service will already be running. WinRM can be enabled locally with PowerShell or remotely in an enterprise with GPO. ← orthrus – A tool to manage, conduct, and assess security testing of autotools projects.